This post contains affiliated links. I receive a small commission if you purchase anything by clicking these links. Hope you all had a great weekend friends! 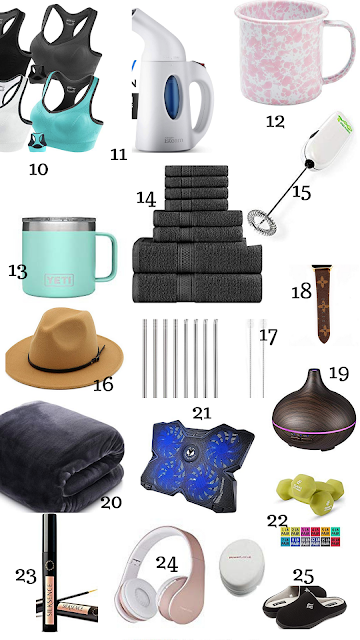 I've been asked by a few of you on my Insta Stories on what are my favorite finds on Amazon the last few weeks so I put together 25 items I've saved into my cart, as well as purchased, and the best part is that they are all under $25! I hope you enjoy some of them as much as I do and if you decide to get a few, let me know what you're wanting to get or thinking or purchasing! I'm also thinking that Michelle Obama's new book Becoming may be March's book club novel if you all are interested in voting for! Let me know what you think and how our February book club is coming along! Any new books you're loving reading right now? I swear that I am on Amazon every single day. I was just on there buying leggings this morning. What awesome things. I shop Amazon often. In fact, I just did it last night. I could use more wireless headphones so I might have to check again. I think I need those joggers! LOL Those look so comfortable and I live in anything that is comfortable. I've actually tried #10. Those sports bras are SO COMFY and durable. These are all wonderful deals on Amazon! The wireless headphones and memory foam slippers caught my eye! I see several things on this list that I would love to have! Who doesn't shop at Amazon. The UPS truck is always dropping something off from them at our house. Great choices at great prices. I loved the Michelle Obama's book!! This list is amazing!! I found cute Gifts I can purchase for my sister for her Birthday thank you for sharing the items with us. I see a few things I really want. At the top of that list is Michelle Obama's book. I read Michelle's book and loved it! I want to try those Elderberry gummies. Super fun post! I am Amazon Prime OBSESSED!! I need to grab a things off your list...LOL!! I just started reading Michelle Obama's book, and I love it so far! I enjoy the convenience of shopping online. I love that cardigan! Amazon is my go-to when shopping, I don't like driving so this place is heaven for me. Defiantly was in need of a new steamer, thank you for these recommendations! Love shopping on Amazon. I am reading Becoming right now. I will have to check those other goodies. You have selected some of my favorite items off of Amazon too. Can't live without my Yeti coffee cup! #1 + #6 is like my go-to weekend outfit. Checking those out! I had no idea I could get eyelash serum so cheaply. I have been wanting to try it. Some really great steals here. I would think many of them would cost so much more than $25! Thanks for sharing. I've been wanting to read Michelle Obama's book! You pick out some nice things on Amazon! I can’t stay off that site! Great list. I love the oversized cardigan! This list is awesome i love it all perfect site for online shoppers. Confession: I was never a big Amazon shopper until recently, but lately I'm obsessed!! So many fun things and affordable things! "Becoming Obama" is on my reading list so I can't wait to buy it. I'm also a sucker for oversized cardigans. I think I found a few ideas on what my husband can give me for Valentine's Day! Great ideas! There are some really cute things here! I am obsessed with amazon and can't wait to add some of these to my next cart! This is a really good list. 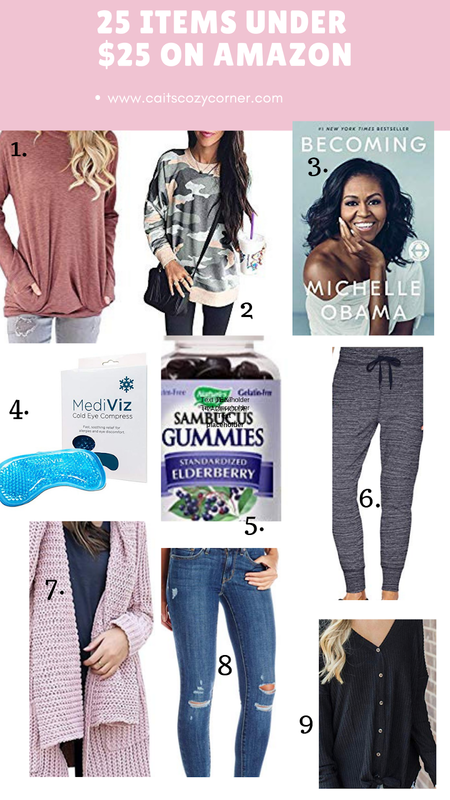 I want the eye mask and Michelle Obama's book. The joggers and sweatshirt look so comfy! I would love to have those. I need that camo sweatshirt in my life now! That YETI mug has been on my list forever... I just need to get it already! What a great list!! ok that fedora is so affordable! i like in in pink like lady gaga on the joanne album! I love elderberry! I’ve only ever tried the syrup though, not the gummies. I’ll have to check them out! Saving this!!! I’m always on amazon trying to find new stuff! Uh Oh. I totally clicked the links of those sweaters - LOL! You have so many great finds! I love the fashion you picked! I love Amazon for books but I still don't use it much for fashion. I definitely need to change that!